Caffeine and weight loss are connected in many people's minds, but there are still a lot of gray areas. How good is caffeine for weight loss? And why isn't my morning quintuple-espresso making me thinner? Well, here's the 'skinny' on caffeine weight loss. The effects aren't as dramatic as you might think, but it shows some promise. Caffeine is a stimulant; it raises your energy level and makes you more aware. And all stimulants suppress your appetite and speed up your metabolism. Amphetamines and cocaine are two stimulants that work great for this. BUT they also have tons of other nasty health issues associated with them, not to mention legal crap!! Stick to caffeine; it's much safer, and it's legal. Caffeine also makes your body do more lipolysis. Lipolysis is the breakdown of fats in your body to release free fatty acids (FFAs), which are then more easily available for your body to use for energy - not for extra weight. And caffeine makes your body do more thermogenesis, that is, produce more body heat by burning fat. All great for losing weight! How Effective Is Caffeine and Weight Loss? Here's the sad part. Caffeine is OK, but not great at burning fat. The ability of stimulants (like amphetamines, cocaine, and caffeine) to suppress your appetite gets weaker the more you use them. So, it's not a permanent solution - more like a crutch to help you get your consumption under control in the beginning. And the findings of studies that show increased metabolism vary. In one study there was between a 2% and 13% increase in metabolism over a 7 day testing period, and in another the increase was 15% - but it lasted only until about 2 hours after the caffeine was taken. Still another showed that the caffeine fat loss effect was only 3 - 4%, and that lasted only for the 2.5 hours after taking 100 mg.
Perhaps the 'pick-up' of caffeine prompts people to be more energetic and thus burn more calories? Maybe they think they should be more energetic, and thus exercise more - and burn more calories? Maybe people usually take caffeine when they wouldn't otherwise be awake, and that increased time awake and moving around increases the body heat that their body makes? Does Caffeine and Weight Loss Work? And How Much Should I Take? All in all, the caffeine and weight loss connection is not beautiful and direct. It doesn't jump out of studies and make scientists and normal people at coffee shops across the land jump up and say, "Holy sh*t, this is the magic weight loss solution we've been looking for!" Caffeine does help with weight loss. The performance benefits of caffeine and exercise together are amazing! And if you want to know how much to take, check out that page on how to take a caffeine supplement to boost your athletic ability. But, to make it really work, a good plan of exercise and nutrition is essential. And with that plan, a reasonable amount of caffeine, in tablet or supplement form, might help you - both for your exercise, and simply for losing weight. 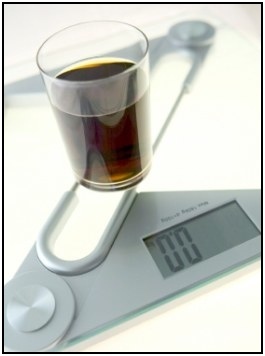 • Click here to leave 'Making Caffeine and Weight Loss Work For You' & go back to the Home-page! 1. Weinberg, Bennett Alan, and Bonnie K. Bealer. 2001. The World of Caffeine: The Science and Culture of the World's Most Popular Drug. New York: Routledge. Pp. 286. 5. Wildman, Robert E. C. 2006. Handbook of Nutraceuticals and Functional Foods. Boca Raton, FL: CRC Press. Pp. 455.